Another religious building for last March's entry for 9Q Magazine. This time it's an even older church and comes with about a 1000 years of controversy. One of the most popular and highly regarded historic monuments in Spain, it's known by everyone as the Great Mosque of Cordoba although only Christian worship takes place there since 1236. There is a reason for this duality as it was originally built as an Islamic temple by the Moors who dominated the Iberian peninsula for much of the Middle Ages. 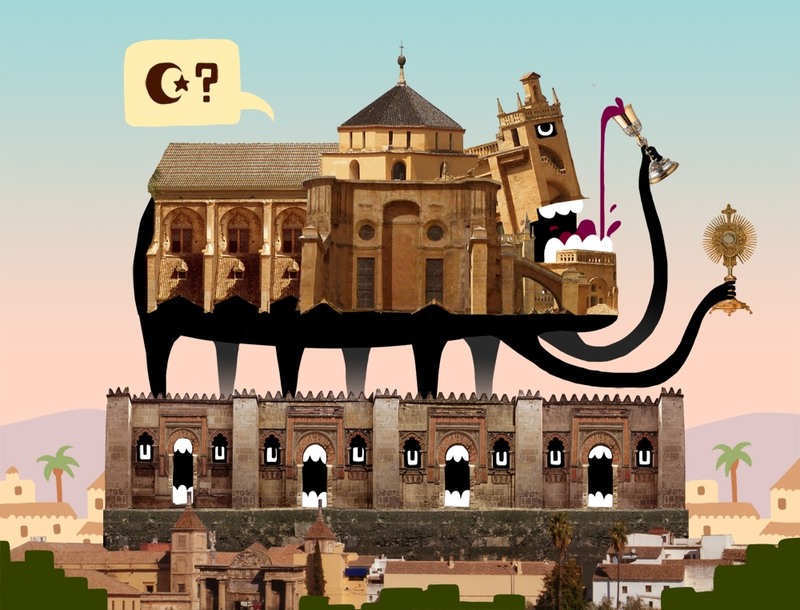 However, in the 13th Century Cordoba, together with Al-Andalus –modern day Andalusia– was eventually conquered by the Christian Castilian army as part of the much debated 'Reconquista' and the Great Mosque, was subsequently turned into a church. 300 years later, in an intensely Roman Catholic country, local religious authorities began questioning, 'how come it doesn't look Catholic enough'? They then proceeded to convert it into a full-on Renaissance cathedral, not by rebuilding it from scratch but by literally 'stuffing' it at the very heart of the ancient temple. Upon completion, Holy Roman Emperor Charles V's famous remark soon followed: 'something unique has been lost to something vulgar'. This practice wasn't anew, replacing 'old' religion buildings had been done before; the mosque itself had been erected over a Visigothic temple and before over a pagan Roman. This mishmash of styles is what makes it such an interesting and exciting piece of architecture. However, even after surviving the gloomy Inquisition days, there is now another chapter to this story. In recent years, the Cordoba canonry has been running a dubious policy of blurring the temple's Islamic past –for example by omitting the term 'mosque' in promotional material– and this has revealed a subtle move by the Catholic Church to claim the legal ownership of the building and the land it stands on. An obscure law passed under the Conservative government a few years ago would have enabled to enter this UNESCO World Heritage Site into the land registry for 30€ only. The local council has raised a formal pledge to claim the Mosque/Cathedral for its citizens but has recently been dismissed by the central government in Madrid. After all, the Church has successfully administrated the building for 775 years. A setback for a city that was once a symbol of the meeting of three faiths. It seems as though Spain is not quite yet ready to lay the ghosts of the Reconquista to rest.